It’s the second leg of the of the European Trophy, and the main question seems to be “who will be promoted alongside the Netherlands”? 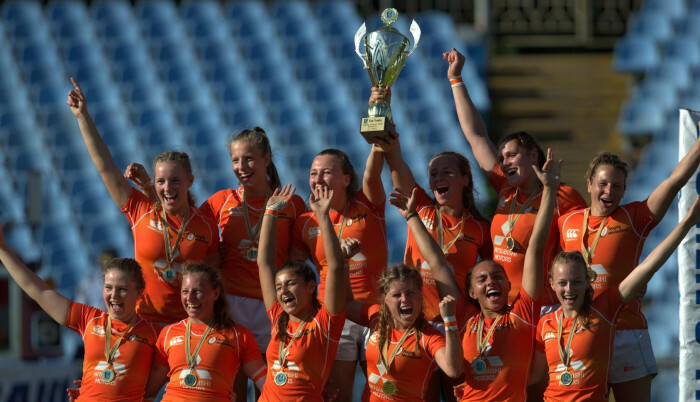 The first leg of European Trophy two weeks ago was all about the success and promise of the young, new Dutch sevens squad who raced to the title in Dnipo, conceding just three tries over the weekend. So strong were the Dutch that the idea that they might fail to win a place in next year’s Grand Prix seem inconveivable, so the question is who will join them – and who will drop into the Conference in 2019. Promotion realistically looks like being between Sweden and Ukraine. The later used home advantage to their benefit, being the fancied by disappointed Swedes in a crucial semi-final that is likely to be repeated Esztergom (Hungary) this weekend, if games go to form. However its not cut and dried for these two and there are a few potential banana skins – most notably Romania who beat Ukraine in their pool game in the first leg before coming up against the Dutch in the semi-finals.They face Sweden this time in the pools. Hungary also continued to impress and exceed expectations in Ukraine last time, and could cause trouble. The Trophy is all about relegation too, and in this case its Latvia who look odds on for the drop, while Israel will need to somehow get the better of Austria if they are to achieve another escapology act this year. Based on the first leg that will not be easy. The other four teams – Switzerland, Finland, Norway and Czechia – look safe. Play begins on Saturday at 10.00 CET with a live stream. Live stream, draw and results.